In the November SpamRankings.net from PSBL data, Global Crossing's AS 3549 GBLX spiked on 17 November and a few days before, pushing it into fifth place. There's also a peak for grum (green line near the bottom) on 17 Nov, and peaks for festi and n/a on 18 Nov, where n/a is CBL's marker for spam they detected without having to look as far as determining which botnet they think sent it. So the spam spike could be from cutwail. 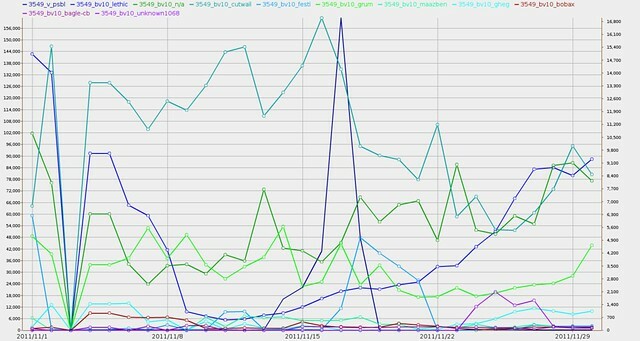 Or it could be because of a coincidence of several botnet peaks. Or it could be some other botnet that happened to do a spam campaign on that day. Given that the PSBL GBLX peak builds up on 16 Nov, I'd guess it came mostly from cutwail. Tags: Bank of America, Canada, CYBERSURF, India, infosec, reputation, spam, SpamRankings.net, U.S.